Emerging competition from high-speed trains will pose a threat to the nation's airline industry, which has not yet fully recovered from the worst economic crisis in decades, a top airline executive warned yesterday. "The industry is still facing uncertainties due to the macro economic situation. 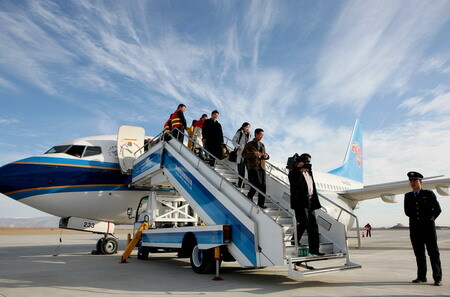 But a more urgent issue is the challenge from high-speed trains," said Si Xianmin, chairman of China Southern Airlines. "Over 80 percent of the domestic aviation market will be impacted and about 518 flights are expected to see a 50-percent plunge in traffic when the planned high-speed rail lines enter service," Si said at the Aviation Outlook Asia forum yesterday in Beijing. Si said competition from high-speed trains is already on the rise. The airline's weekly traffic on the Shanghai-Wuhan route has dropped by 30 percent since high-speed trains started service on the route, while its weekly traffic between Beijing and Taiyuan has plunged by over 60 percent, also due to the same reason. Expansion of the high-speed train network is a national priority and a core component of the government's economic stimulus measures. China will, by 2020, build 18,000 km of high-speed passenger rail lines where trains travel over 250 km per hour. This is expected to account for over half of the world's total high-speed rail lines. Compared with air travel, bullet trains enjoy advantages such as a better safety record, a more comfortable travel experience, larger capacity and lower fares. Si called for "policy support" such as tax breaks to help airlines lower costs and more efficient cooperation with airports and air traffic management authorities to make air travel more competitive. "Airlines can also include the railway system as part of their package and use it as a feeder. The railway system can feed traffic if it is used correctly," said David Brett, Asia-Pacific president of Amadeus, a world leading IT provider to the travel industry. China's three biggest carriers all turned profitable in the year's third quarter due to strong domestic air travel demand. Air China posted a net profit of 885 million yuan ($129.61 million), compared with a loss of 1.97 billion yuan a year ago. China Southern, Asia's biggest carrier by passenger number, reported a net profit of 284 million yuan, compared with a loss of 830 million yuan a year earlier. China Eastern Airlines reported a profit of 23.2 million yuan, compared with a net loss of 2.33 billion yuan during the same period last year. China Southern will add three Airbus A380 jumbo jets to its fleet in 2011 and start to receive Boeing B787 Dreamliner planes in 2012 to expand its international network, Si said. Africa and South America will be the new focus areas for its international expansion, Si added. Currently, domestic operations account for 80 percent of the airline's total business. Also yesterday, the US-based ARINC Inc, the world's largest data link service provider, signed a memorandum of understanding during the forum to extend its partnership with the Aviation Data Communications Corp of China (ADCC) for another four years. They will further develop aviation data link communications for the Asia-Pacific region. ADCC is the only data link service provider in the country approved by the Civil Aviation Administration of China.